NEW! Better than a cinnamon sticky bun...but you'll still be licking your fingers! These sweet babies are gonna be your new favorite for breakfast, brunch, or with a schoop of ice cream for dessert. Pop 'em frozen in your oven and fill your home with the sweet aroma. Yum! Serv. Size: 1/2 Biscuit(55g), Amount Per Serving: Calories 250, Fat Cal. 160, Total Fat 18g (28% DV), Sat. Fat 11g (55% DV) Trans Fat 0.5g, Cholesterol 50mg (17% DV), Sodium 140mg (6% DV), Total Carb. 22g (7% DV), Dietary Fiber 1g (4%DV), Sugars 19g, Protein 1g, Vitamin A (10% DV), Vitamin C (0% DV), Calcium (4% DV), Iron (2% DV). 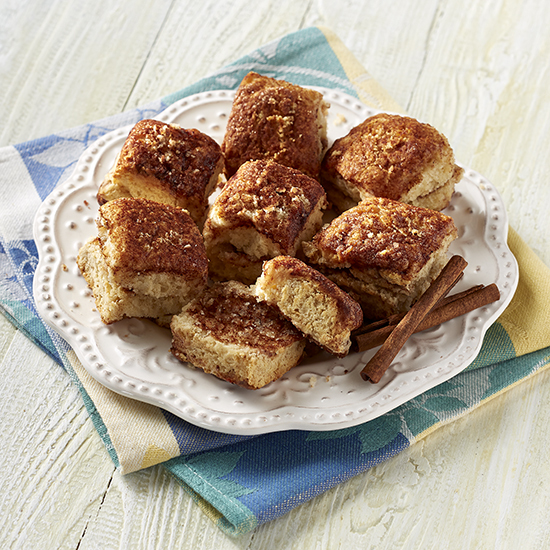 Your Sassy Cinnamon Biscuits will ship frozen and may arrive partially thawed. Please freeze upon receipt.